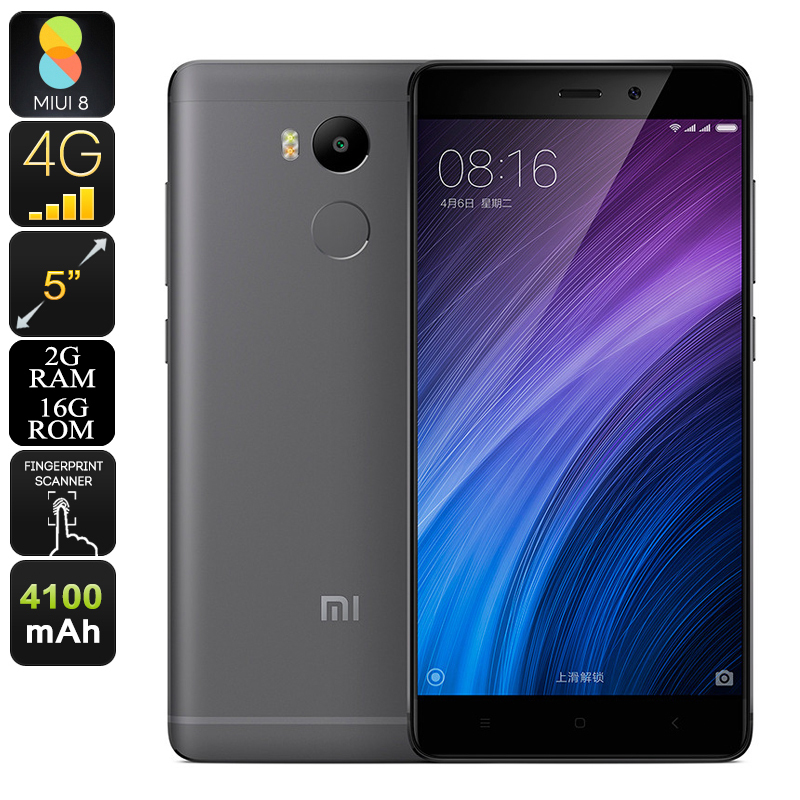 Successfully Added Xiaomi Redmi 4 Smartphone - Android 6.0, 2GB RAM, Octa-Core CPU, 5 Inch Display, 4100mAh Battery, Finger Print Sensor (Grey) to your Shopping Cart. Meet the Redmi 4 smartphone, one of Xiaomi’s latest Android phones that features a sleek design and comes with some serious hardware comparable of that found in the latest flagship devices. Its MIUI 8 operating system has been based on Android 6.0 and comes packed with all the latest familiar features Android users are used too. With its smooth and ultra-fast performance, this Chinese smartphone truly is a pleasure to use – providing you an absolutely stunning user experience. Supporting two SIM cards and featuring Dual-IMEI numbers, this Android phone allows you to be connected to two providers simultaneously – giving you a platform on which to easily separate your work and private life. Its 4G connectivity ensures that, no matter where on the globe you’ll be located, you will always be able to stay connected to your friends and family back home. Streaming movies online, engaging in long distance video calls, or simply browsing the web - with the Redmi 4 it does not matter where you are as can always browse the web in lightning speeds. Additionally, this Dual-SIM smartphone supports Dual-Band Wi-Fi, letting you enjoy incredibly fast data speeds while at home or in the office. Packing the Snapdragon 430 CPU that has been clocked at 1.4GHz this 5 Inch smartphone delivers a powerful performance. Built for speed, this Octa-Core CPU lets you launch the most demanding of applications in a spit second. Its 2GB of RAM furthermore lets you engage in excessive multitasking sessions without slowing down your device. So head out to the play store and download the latest mobile games and applications. Along with its 5-Inch HD display, the Redmi 4 is guaranteed to handle all your demands and lets you enjoy your favorite media in absolutely stunning beauty. Packing 16GB of memory and giving the added possibility to add an additional 128GB of external storage provides you with enough space to store all your favorite files and media alike, allowing you to carry along hours worth of mobile entertainment where ever you go. With its 4100mAh battery this Android phone lets you head out with confidence as with numerous hours of continuous usage time you no longer have to fear about running out of juice while enjoying the outdoors. Featuring a 13MP rear camera the Redmi 4 smartphone allows you to snap absolutely stunning pictures and footage while out in nature or sharing a special moment with your friends – ensuring that from now on not a single moment passes by uncaptured. Additionally, this Chinese smartphone provides a highly accurate GPS and navigation system, allowing you to head out without needing to worry about getting lost in the wild. The Xiaomi Redmi 4 comes with a 12 months warranty, brought to you by the leader in Android phones as well as wholesale electronic gadgets..